Life is full of unexpected twists and turns. There is always that element of surprise in our lives which may strike anytime and change our lives forever. There are umpteen stories told where people have struck gold by a curious twist of fate or have faced complete disaster. Simple stories emerge from these incidences and one such tale is that of the movie Sawan Ki Ghata. It is a story which all can relate to, with the settings in rural India. The movie is produced and directed by Shakti Samanta. The story revolves round Gopal and Seema. In a small village in India two children, one poor and one rich become friends. The rich father however disapproves of this budding romance and sends the boy away. 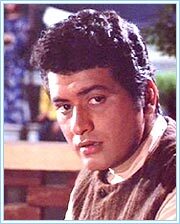 Gopal (Manoj Kumar) as the righteous young man returns to his village only to find out that his father is dead. He meets Seema ( Sharmila Tagore ) and realizes that love still lingers. But his stepmother and her brother together with Seema’s father prove to be stumbling blocks in the lovers’ path and Gopal’s rightful inheritance. Adding to this are the rumors of sighting his father’s ghost. Gopal manages to steal some tender moments with his lady love Seema, only to have the golden moment broken due to a misunderstanding. This is when Seema steps forward and tries to stop her beloved from stomping away from her. The song Zara Hole Hole Chalo More Sajna is beautifully picturised on Sharmila Tagore and Manoj Kumar. The sensitive lyrics have been written by S.H. Behari and the extremely talented musician O.P. Nayyar gave it life. 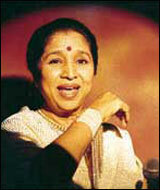 Asha Bhonsle with the depth and richness of her voice brings a smile on each one’s face with her rendition of the song. This very romantic song touches one’s heart when she pleads with her beloved to walk alongside her and get lost in their mystic surroundings. Cinematographer V. Gopikrishna showcases the village with its beautiful view in his camera shots. The song set in these surroundings is a sight for sore eyes as Sharmila looks charming as ever and Manoj Kumar is his usual diffident self. 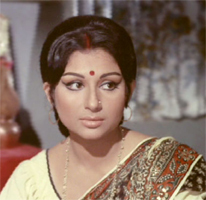 Seema, (Sharmila Tagore) in the song tries to convince Gopal (Manoj Kumar) that they should not let petty fights and misunderstandings come in their way, but instead should think of spending as much time together as possible. According to her, anger is no solution and will only get in the way of true love; after all both of them are incomplete without the other. She asks for forgiveness and wishes not to waste any more precious time quibbling. 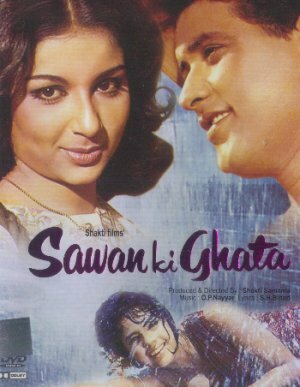 The song which shows Gopal enjoying himself and pulling Seema’s leg by pretending to be angry ends wonderfully with him whistling the lines of the song. This very romantic song has light playful music and definitely adds life to the atmosphere. It is a treat to lovers of all ages and is extremely soothing to the ears. In fact even today it is able to evoke the same emotions as it did in the yesteryears. Download and enjoy this melody. Click here to download. © Copyrighted to Asha-bhonsle.com All Rights Reserved. This entry was posted on Wednesday, May 9th, 2007 at 9:05 am	and is filed under Melody Pearls. You can follow any responses to this entry through the RSS 2.0 feed. You can leave a response, or trackback from your own site.